The Underground Railroad was a 280-year American phenomenon which served as the boldest and most active foil to slavery. Because the Underground Railroad was clandestine, its safe-house operators and conductors—black and white alike—who ushered people to freedom had to keep their roles hidden. If caught rendering aid to freedom seekers, they were arrested, convicted of interfering with supposed property rights, and sentenced. All who rendered aid risked everything they had to do so, some losing all they had. Because those who rendered aid were often persecuted long after the Civil War and the Underground Railroad ended, most took their noble secrets to the grave. One who did not was Marion Michael, great-grandfather of the author, who could not be prosecuted because he was a minor when he rendered aid. Until he died in 1937, Marion told of his, his parents' and siblings' Underground Railroad work. His descendants keep this family history quite alive today. An American Family of the Underground Railroad is authored by the descendant of the actual safe-house operators who owns the very farm where his ancestors sheltered freedom seekers. Cooling Springs Farm might be the sole remaining Underground Railroad safe-house in the nation still owned by the same family that used it in Underground Railroad times. 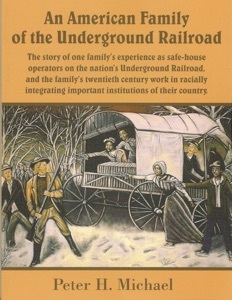 An American Family of the Underground Railroad provides to general reader and scholar alike a wealth of detail about a web of Underground Railroad sites in a single county with a map of the sites, and identifies several safe-house operators and a key Underground Railroad conductor there. With a bibliography of nearly 150 sources, this is one of the most thoroughly documented works on any single Underground Railroad safe-house. An American Family of the Underground Railroad helps reawaken the nation to its defining heritage of the Underground Railroad. Return to the Books page for other Peter Michael books.